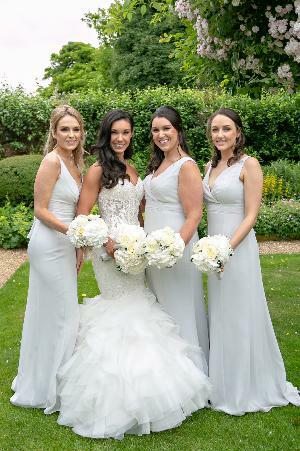 Rachael and Dan's glamorous day was complemented by a romantic colour palette of soft grey, whites and creams – Ed Sheeran made an appearance too! Rachael Kelly and Daniel Rice were introduced through friends whilst Rachael was out celebrating her 18th birthday. 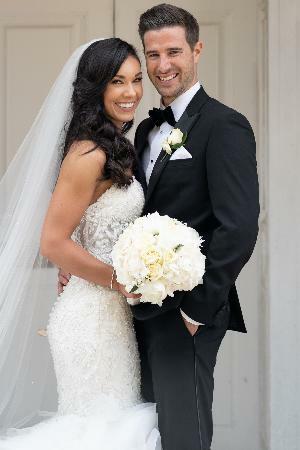 A whole ten years later, Dan popped the question in Venice, much to the delighted of their friends and family who had been waiting a long time for such news! “Dan whisked me away to Venice for the weekend,” recalls Rachael. “Disguising it as a work trip and it being for his own birthday that weekend. 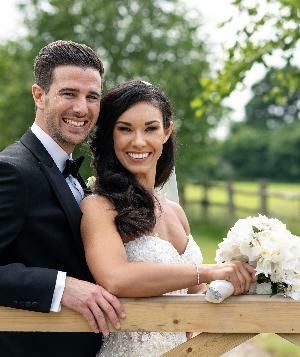 The happy couple set the big date for 8th June, 2018 and tied the knot at St Johns Church, Merrow, Guildford, followed by reception at Northbrook Park. 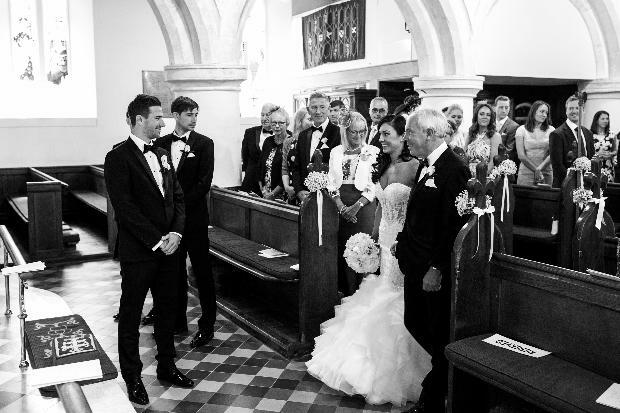 We had always spoken about getting married at our local church in Guildford as a lot of our family members have also been married there so it holds a lot of memories. 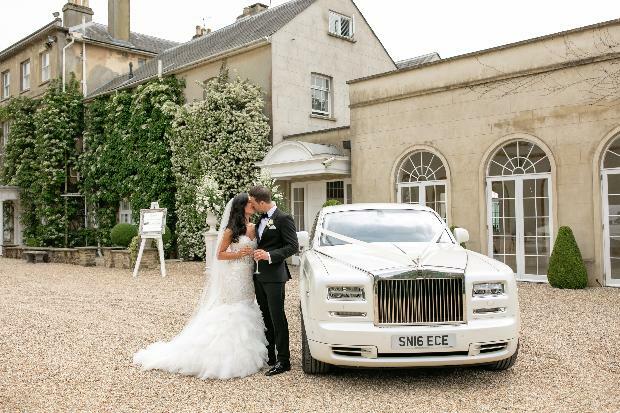 We knew we wanted beautiful grounds and when we got to Northbrook Park that's exactly what we got. The gardens are amazing, and the house is stunning it's exactly what we wanted – they even had peacocks roaming around which was an added bonus. The day after our wedding everyone couldn't stop talking about the flowers they really were beautiful. Rhubarb and Bramley did an incredible job. My bouquet had cream and white hydrangeas, peonies, roses and gypsophila as did the bridesmaids' and this was the flower theme throughout. 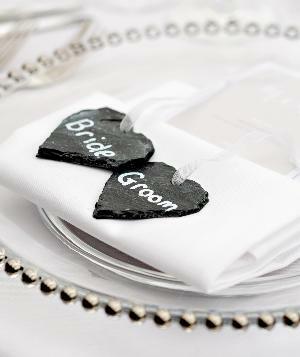 We wanted to do something different to the normal place names so we ordered some slate hearts and tied them with white ribbon. My mum then wrote each name on to a heart with a chalk pen. We were so pleased with how they turned out and a lot of our guests took them home as a little memento. The centrepieces were incredible it was one of the first things we both noticed when entering the orangery for our wedding breakfast. We had large conical vases with an arrangement of peonies, hydrangeas and roses on top. 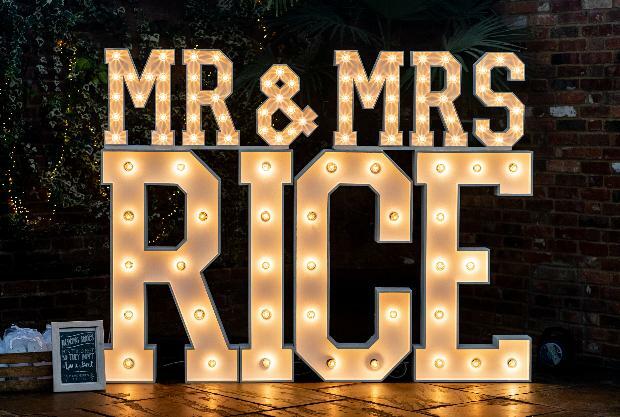 We hired some 'Mr & Mrs Rice' light-up letters and one of our favourite pictures of us was taken by these so we're so glad we hired them. The cake was delicious this was made by a company called Wiggle Cakes, who we'd used before so we knew they would do a great job and they really did. 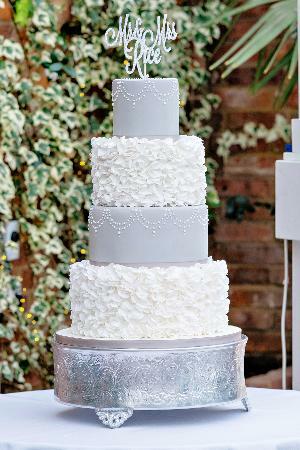 We picked a four-tier prosecco sponge cake, with white ruffles and light grey icing. 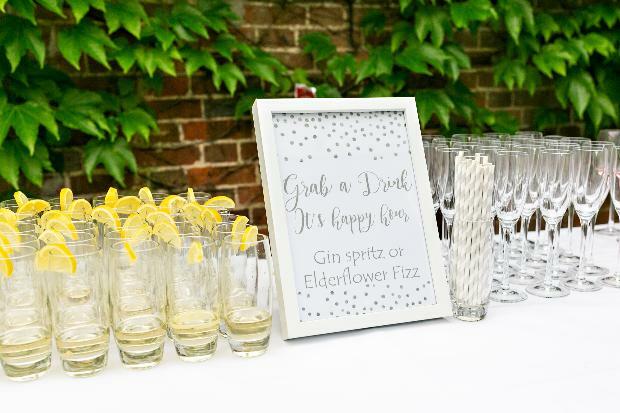 Happy hour was a success, after the speeches guests were able to help themselves to pink gin spritzers and elderflower fizz accompanied by grey and white stripy straws – our colour scheme! 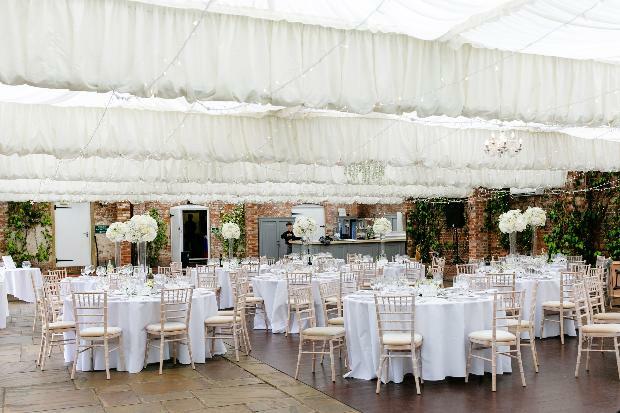 We met with a company called To have and to Hire who were brilliant and provided us with a fairylight canopy and hanging wisteria chandelier. 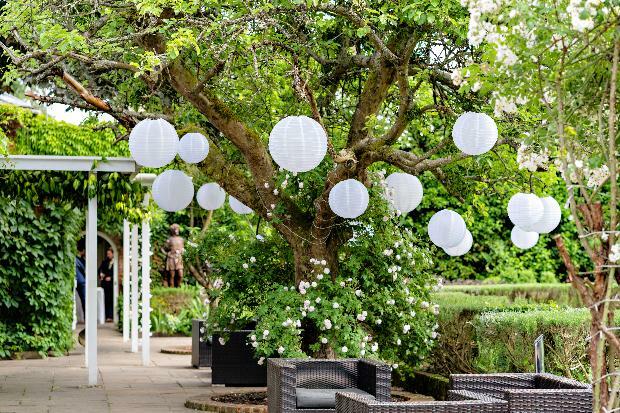 They also put white lanterns in the trees in the garden and covered the walkways with rose garlands. It looked like an enchanted garden when we arrived, just magical. We had a drinks and canapé reception on arrival, with a cello and guitarist playing, The Silvermere Duo. We had some garden games such as giant Jenga, chess and Connect four. We also had a selfie station where there were props for guests to use to create some funny selfies, the pictures the next day were ones to remember! I wore a Morilee by Madeline Gardiner dress, Muse 8177, which was bought from Windsor & Eaton Brides. The boutique was on Eton High Street and was a little gem of a find. I loved the detailing on my dress the bodice was so intricate and delicate and the full skirt looked so good in the pictures. As there was quite a lot of detail on my dress I wanted to go with something quite classic for my accessories, I just went for simple diamond stud earrings and necklace and a swarovski hair vine. 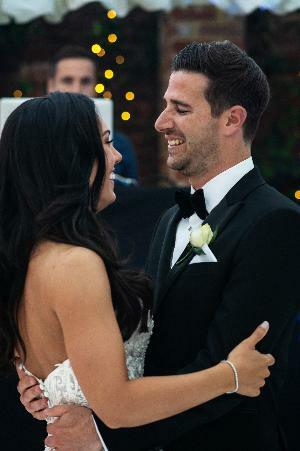 Dan wore a black tux bought from Moss Bros. Most of his groomsmen wear suits everyday for work so we wanted to go with something that wouldn't have them feeling they were getting ready for a day at the office. 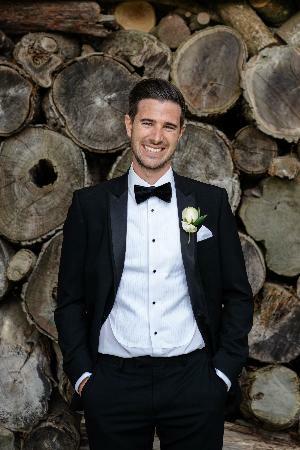 You can't go wrong with a black tux and they all looked so smart and handsome. Walking down the aisle as husband and wife was the best feeling ever. We couldn't stop smiling for the rest of the day. Aidan one of the best men did a hilarious speech where we played Mr and Mrs and I think our guests learnt a lot more about us as a couple after that! 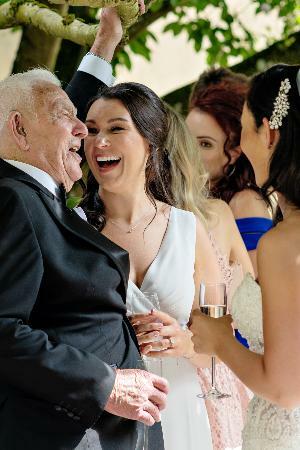 He also organised for friends, family and work colleagues to be part of a video telling funny jokes and facts about Dan, everyone got involved and there was so much laughter around the room. I found it really difficult to decide on bridesmaid dresses. I knew I wanted them long and ideally grey. I finally decided on a style from Maids to Measure and went with the Lisette fitted dress in dove grey. The girls tried them on and they looked stunning. The dresses had a really flattering V-neck and fitted waist to show off there incredible figures. Later on in the evening we had our first dance, we picked the song Perfect by Ed Sheeran. We are both big Ed Sheeran fans and have been lucky enough to see him in concert a few times, never did I ever expect that we would get a video message from the man himself wishing us a happy wedding day and loving life together! 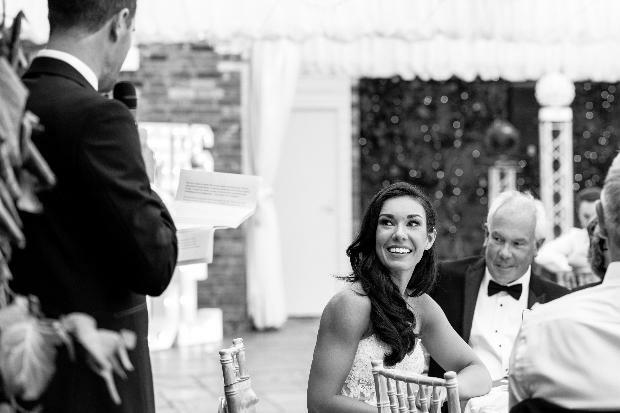 Dan had organised this all himself and it was a complete surprise for me and all our guests I was in total shock that I had to get Ollie the DJ to play the video several times over just to be sure it was actually happening!